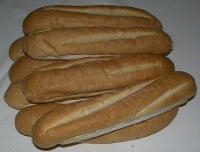 Two dozen of Amoroso’s Special Hoagie Rolls; the ones you can’t get anywhere else in the country. We get them fresh from the oven, carefully package them for shipment and they're delivered to you. Keep some out for immediate use and freeze the rest in Zip Lock bags. Please note that this package is shipped via FedEx or USPS Priority Mail depending on the destination. Every year my husband and I order rolls for our Super Bowl party. They are always fresh and a big hit for our California super bowl parties. Our guests love experiencing a little taste of Philly. We are always very pleases with all orders from Philly Food. The Rolls arrived in great shape. Thank you for packaging them so good. They tasted just as good as I remember. I will definitely order them again.